Our signature gold plated t-bar on a sterling sliver belcher chain. The link size and weight make this the perfect layering accompaniment to other much loved bracelets and bangles. The T-Bar measures 2.5cm in width and the bracelet is 19cm. Our chic, gold plated bangle gets a stunning style upgrade with the addition of a sleek t-bar. Impactful when worn on its own. Emits supercharged style when intermingled with other bracelets and bangles. The torques measures 0.5cms wide, weighs 33 grams and the t-bar its self is 3cm in length. Our chic, sterling silver bangle gets a stunning style upgrade with the addition of a sleek t-bar. Impactful when worn on its own. Emits supercharged style when intermingled with other bracelets and bangles. The torque measures 0.5cms wide, weighs 33 grams and the t-bar itself is 3cm in length. A vintage-inspired Pope pendant on a delicate belcher chain. 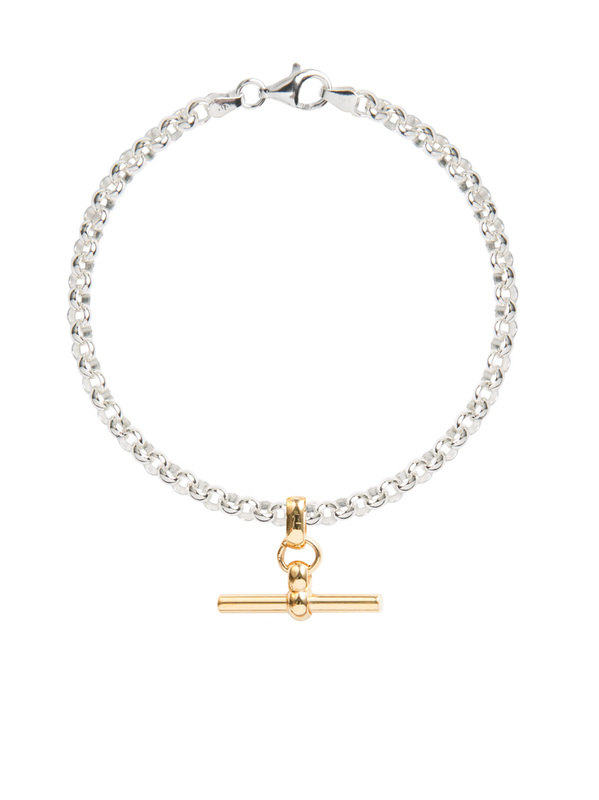 The link size and weight make this the perfect layering accompaniment to other much loved bracelets and bangles. The gold plated, sterling silver chain is 19cms in length and the charm is 1.5cms in diameter. An elegant gold plated Virgin Mary charm teamed with a heavy link bracelet makes for an impactful statement piece you'll wear again and again. The sterling silver, gold plate bracelet is 19cms in length, weighs 35 grams and is 1cm wide. The charm is 2cms in diameter.